I’m going to be honest here. This helicopter tour in Alaska was truly one of my favorite things I’ve ever done in my life. We’ve gone on all kinds of adventures, like skydiving in Moab (and all over the country), backpacking in Yosemite, shooting a wedding on a spacenet 400 feet above the ground, hiking in the Fitz Roy mountains in Patagonia, making iced coffee from water + bergy bits from a glacier lagoon near Cerro Torre, DRIVING to Alaska, just to name a few. 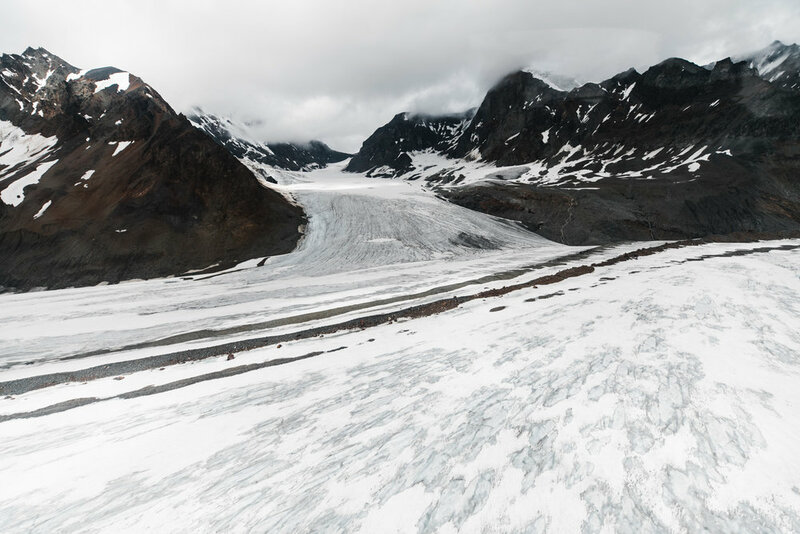 But I will never ever forget the feeling of landing a helicopter on an Alaskan glacier next to Denali National Park and stepping out on to the ancient ice. Someone asked me a few days ago if I feel drawn to bodies of water like I do to mountains…at first I answered no, not really. I’m not an ocean/lake person. But then I realized, if you count ancient, frozen bodies of water…then hell yes I do. I actually can’t remember when my obsession with glaciers began, but I’m guessing it was around the time I got psyched on mountaineering adventure books like Into Thin Air and Touching the Void, just to name a few. I do remember reading Enduring Patagonia and despite the descriptions being pretty grim, thinking I’d love to walk across a glacier into the mountains one day. And then of course, there are the films about places like Baffin Island (#1 on my bucket list right now) and Greenland. Or photos of ice climbing in moulins in Iceland. 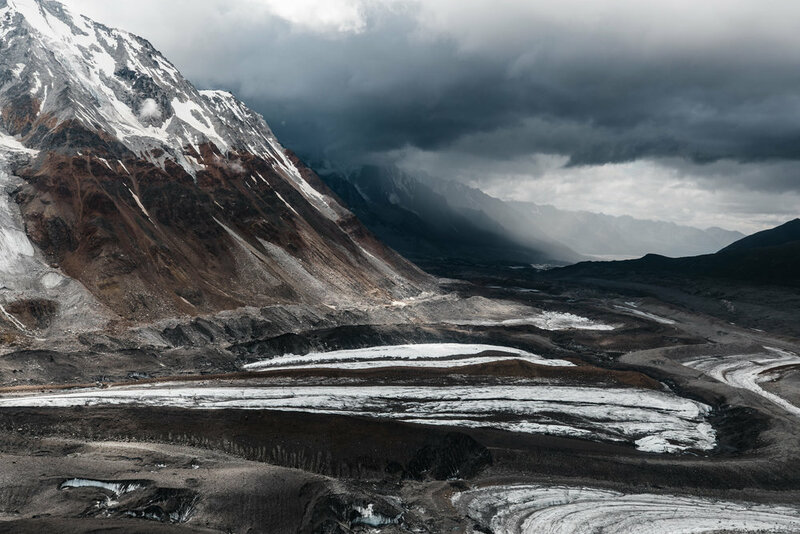 There is just something about the power, the vastness, and of course, the color of glacial ice that absolutely blows my mind. So, when Morgan reached out to see if we were available to photograph her and Evan’s intimate wedding at the Denali Airstrip, and then mentioned they were hoping to do a helicopter flight-seeing tour that involved landing on a glacier, I rearranged our original plans to make sure their dates squeezed into our Alaska itinerary! I’ll be blogging their gorgeous intimate wedding separately, but their elopement-style first look and adventure wedding portraits on Yanert Glacier absolutely deserves it’s own post. The day of our helicopter flight-seeing tour, I woke up nervous (for obvious reasons!!). I triple-checked our camera batteries, packed way too many extras, and did the same with cards. I knew we’d have limited time once we actually landed the helicopter on the glacier, so I made sure I was dialed on the general vibe we were going for, as well as making a list of must-have shots in my head. Morgan and Evan were beyond excited as well! They had taken plenty of flight-seeing tours in the planes with Denali Air, but this was their first time in a helicopter too! We headed over to Temsco Helicopter Tours and got all set. When we finally loaded the chopper, the nerves were replaced with total psyche. It was so wild how the helicopter could fly so close to the terrain, we literally looked for bears and counted sheep as we flew out near Denali National Park. As we neared the mountains, the pilot mentioned we could land pretty much anywhere, so let him know if we see a spot we’d like to stop (!!!!!!). Callen spotted a gorgeous green ridge with excellent views of the mountains and glaciers, so we circled around and landed there for the first look. Evan and Callen wandered away while Morgan changed into her wedding dress next to the helicopter. 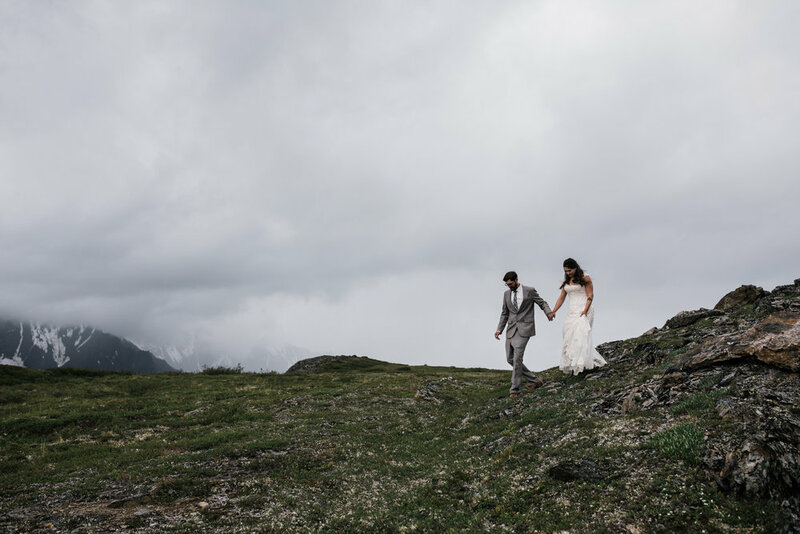 They shared their first look in their wedding clothes on a hillside overlooking the mountains and glaciers and then made their way back to the helicopter so we could go to our next location, on the glacier! As we flew over the glacier, we saw epic ice falls, gnarly crevasses, and beautiful blue streams to little meltwater ponds. We made our way as deep into the valley as we could go, up next to some of the towering mountain walls. Much like my very first skydive over Moab, I’ll never forget the feeling of the helicopter landing on the glacier, opening the door, and stepping out onto the ice. It was my first time on a glacier, after literally years of dreaming about such a thing, and it absolutely did not disappoint. Morgan and Even were equally as psyched, looking around in awe and glancing at each other frequently to see if this was really where they were doing their adventure wedding portraits or if this was all just a dream! 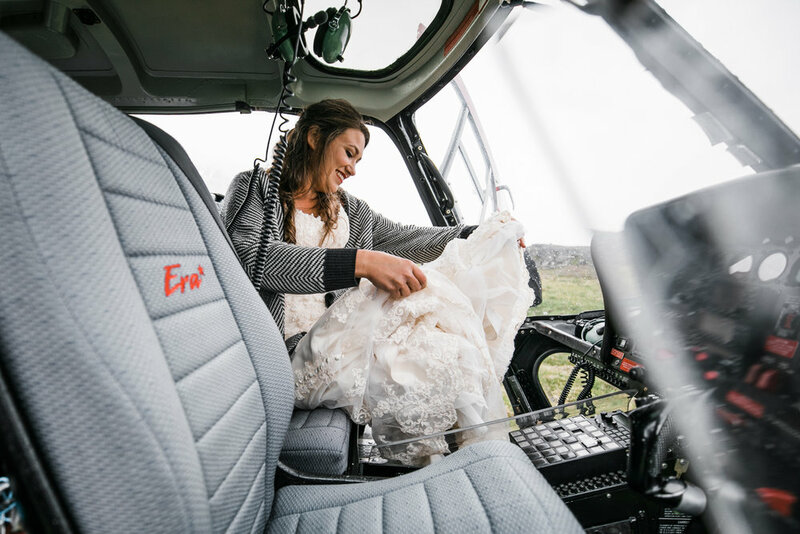 We got right to work, taking gorgeous wedding photos on the ice, admiring the huge mountains, the iconic red helicopter, and of course, the absolutely beautiful wedding couple!! The four of us were in a constant state of awe for the entirety of our tour and while it felt all too quick when our guide informed us we should be leaving soon, the memories are so full of emotion and amazement we really couldn’t ask for more! As we flew out, the four of us were mostly silent, giddy from what we’d just experienced. We all agreed it was one of the coolest things we’d ever done. 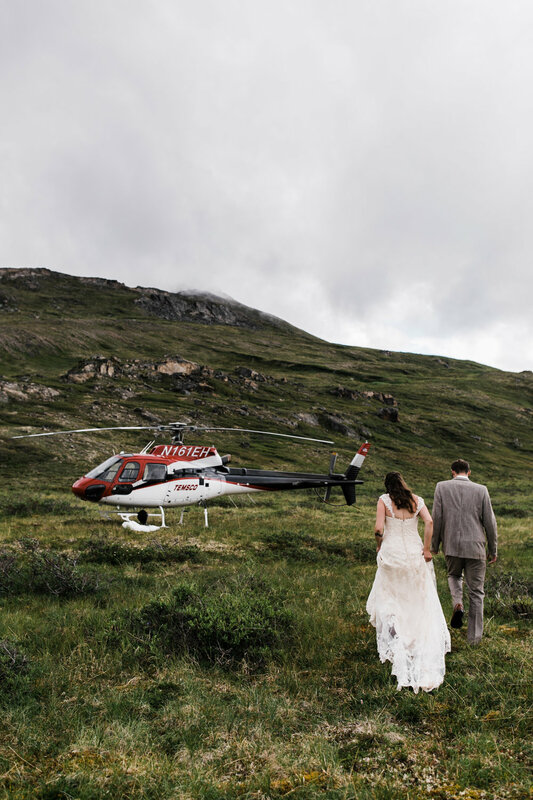 I’m already dreaming of the next time we get to take a helicopter out to a glacier, hopefully with yet another amazing couple to celebrate their wedding!